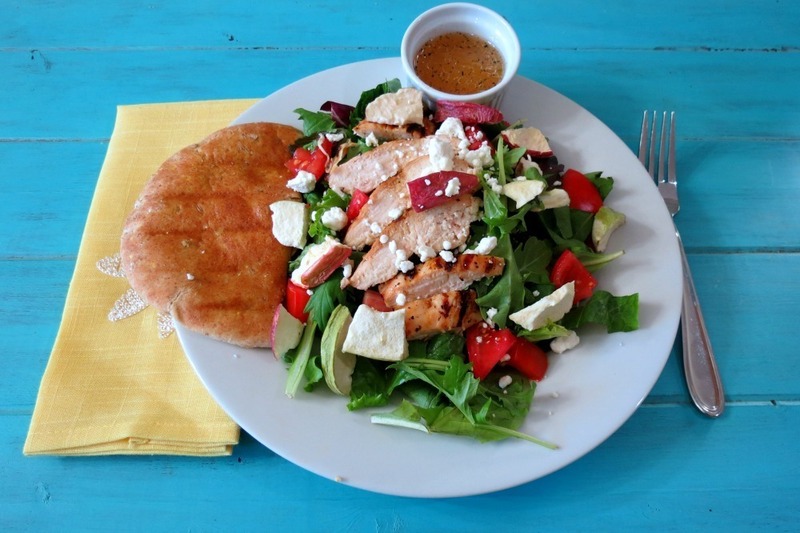 One of my favorite, favorite salads from Panera Bread is the Fuji Apple Chicken Salad. I think I like it so much because of the little dried apples on top. So darn good! 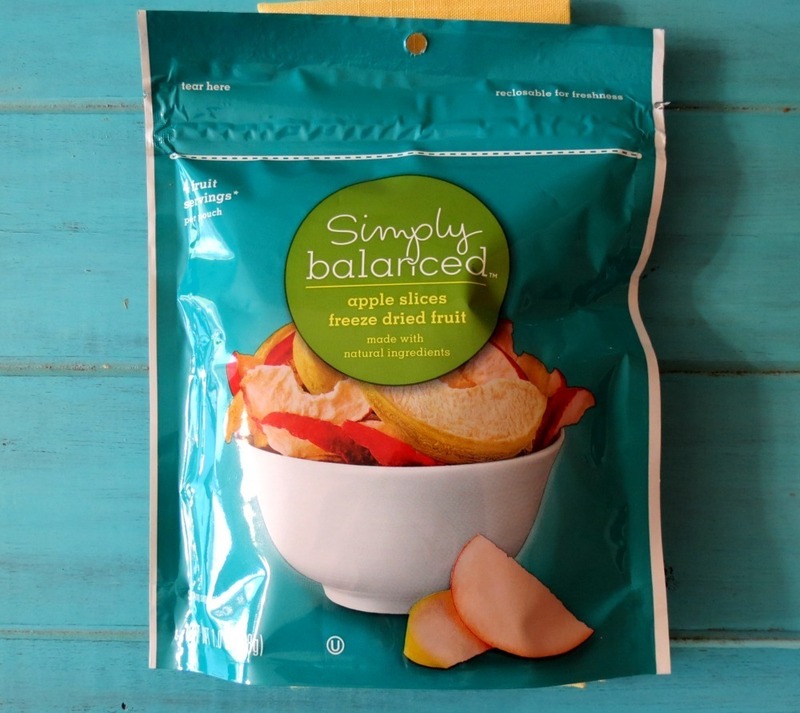 When I was wandering around Target, I saw the Simply Balanced Freeze Dried Apple Chips. Have you had them? They are so yummy and they are the same kind of chips that are on the Panera Salad. So when I opened up my package and had one, I thought, I am soooooooooo making my Panera Copycat Salad!! This salad is amazing! I actually like it better than Panera’s salad! The chicken is fresh, hot and so moist. I marinated it in orange juice and a pinch of pepper. The lettuce is full of life and the apple chips make it all that much better!!! After all the salad wouldn’t be a Fuji Apple Salad with out the freeze-dried apple chips. In case you haven’t seen the Freeze Dried Apple Chips from Target it’s located with the dried fruit. It’s only 110 calories for the whole package. Instead of topping the salad with Gorgonzola cheese I used goat cheese, since it is light and very creamy, but feel free to use Gorgonzola if you like it! I also omitted the pecans that come on the salad. I’m just not a huge on having nuts on my salads. I save the nuts for snacking! I did make my own dressing by trying to copy the ingredients in Panera’s dressing. But some of their ingredients were things I have never heard of, so I kind of came up with my own dressing. The dressing is made with apple cider vinegar, rice vinegar, olive oil, garlic powder, salt and pepper. The dressing gives the salad a nice zing. One thing I love about my salad is that it is fewer calories than the Panera Bread salad. I think my salad stats come in way better!! To save on calories for bread, I served my salad with half a whole grain pita which is 100 calories and has 5 grams of fiber. I think Panera’s french bread is 195 calories. But I do love their french bread baguette. Yummy! 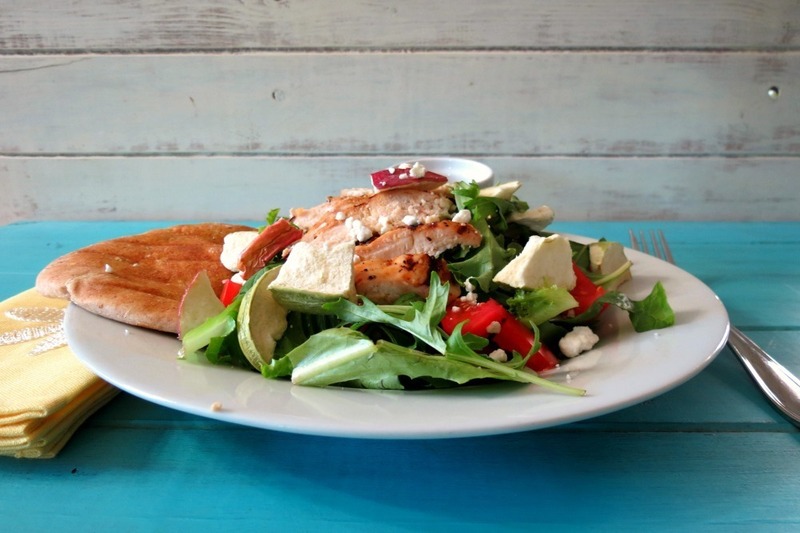 A healthy salad made with grilled citrus chicken, topped with goat cheese apple chips and drizzled with a homemade balsamic vinaigrette. Marinate the chicken in the orange juice and 1 tsp. black pepper for at least 30 minutes. Drain the marinade from chicken and heat the grill to medium. Place the chicken on the grill and cook for about 5 minutes and flip the chicken for about another 5 minutes; cook until no longer pink. Meanwhile, between two plates, add lettuce, spring mix and tomatoes; set a side. When chicken is cooked, let it cool for a few minutes and cut into slices. Evenly divide the slices between both plates and place on top of the salad mixture. 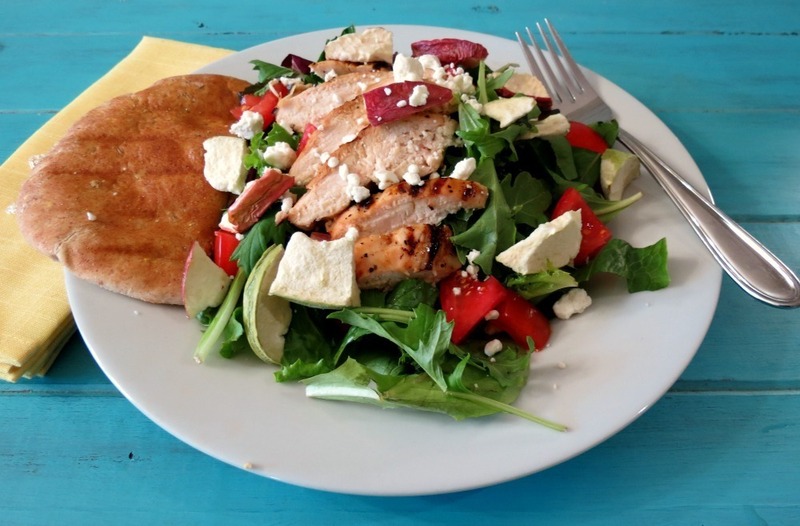 Top the chicken with goat cheese and apple chips. To make dressing; add all of the dressing ingredients in a bowl and whisk until combined. Evenly pour the dressing over each salad. Well my friends, I am having some major server problems and it took me forever to write this post. I am going to cut it short because I am afraid I will lose my post. Way too scary!!! Have a great day and be sure to make your self a healthy salad this week! It’s amazing how much a simple mix-in like apple chips can really MAKE a salad! But it can. It so can. I so agree, because the chips are what really makes the salad! lol, thanks Erin!! Both version are pretty good! 🙂 Thanks you for the tweet!! 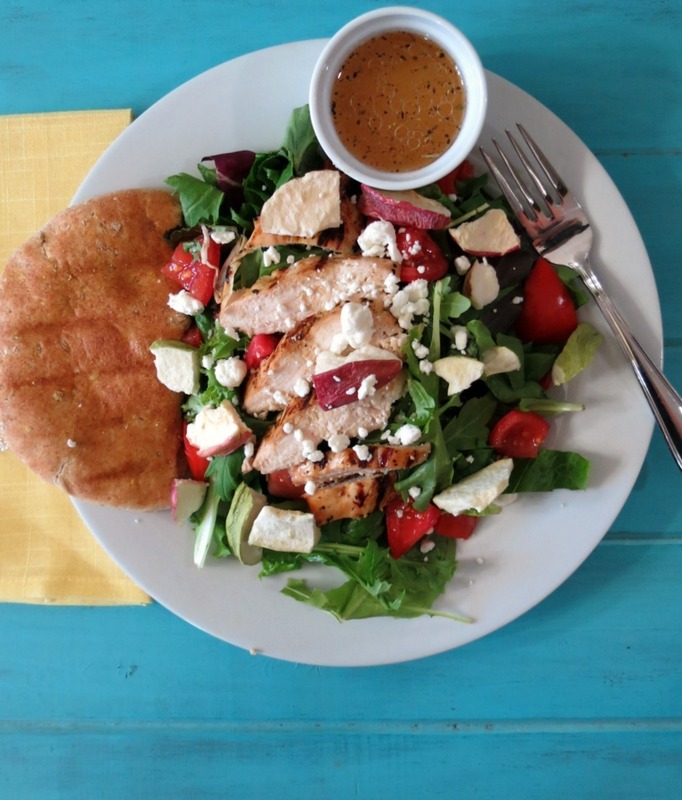 Jennifer, I haven’t had the Panera salad that I know of, but for my money this recipe nailed it (or at least it is something I would definitely want to eat). I love the idea of goat cheese crumbles (not real fond of gorgonzola), and would also consider using crumbled feta. Thanks for posting this. I’m not fond of gorgonzola cheese myself. It’s ok once in a while, but I like goat cheese and feta cheese myself. This looks so good. I don’t have any of the apple chips but I do have the fresh version so I’m just going to have to make a substitution. Thanks for sharing all of your recipes with us. They are all so great. I don’t think I’ve come across one single recipe that’s been a miss. Fresh version will work just as great if not better! I love apples in my salad!!! Oooo, love Panera and this salad! I just saw this recipe on Pinterest. I can’t wait to make it, and love what a terrific job you did turning it into a calorie friendly salad. Omg thank you for telling us where you got the dried apples! I’ve wanted to recreated this salad for a long time but I was never sure where to find freeze dried apples. Very helpful. Just tried this recipe, and the actual salad was super good. Only comment in the dressing is it is very acidic and fortunately I had cherries in my salad and the sweetness from that helped. I would suggest adding apple juice, sugar or some other thing with sweetness to balance it out. But other wise enjoyed thoroughly! I just made this for lunch……Oh Man one of the best salad’s I have ever made at home! I love Panera Bread and always get this salad. Now that I know I can make it just as good at home I will making more stops into my own kitchen instead of driving across town to enjoy it. The only change I made was I used pre grilled rotisserie slices I found at my local grocery store to cut down on the time and just reheated them with a touch of EVOO on the stove. Still came out fabulous and tasty. Thank you so much for posting this recipe. I look forward to seeing what other recipes you have in store for us! !